The term libertarianism essentially describes the political system in which a government prioritizes the individual’s right to own property and enjoy liberty (Takala, 2007). 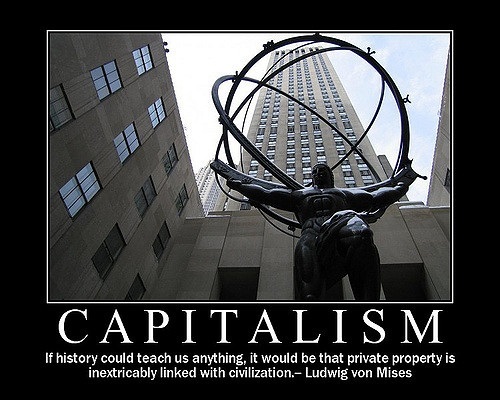 The term capitalism, on the other hand, is descriptive of an economic system that prioritizes the private ownership of property through the trade of manufactured goods in a free market (Klein, 2007). The theories of libertarian and capitalism were first put forth in the course of the 17th and 18th centuries in Europe (Takala, 2007). This period, which also marked by industrialization in various European nations, would see the push for more rights by citizens whose lives were rapidly transformed by the invention of mass production. There have been comparisons drawn between libertarianism and capitalism because these theories both support the preservation of human rights and the ordinary citizen’s right to have his property and life protected by the state (Takala, 2007). However, the manifestation of the real effects of capitalism over the past five decades proves that there are considerable practical differences between these two theories. In the first place, libertarianism is a political theory which holds that private citizens have individual rights, while capitalism is an economic theory that affirms the importance of protecting private enterprise and proprietorship in order to promote free market development and increase capital. The main difference between these two theories, however, has to do with the political and economic structures that emerge in society as a result of their practice. Libertarian law promotes the rights of all individuals to achieve their professional and personal objectives on condition that they do not infringe on the rights of others. In theory, capitalism appears to support the same concept. In practice, however, capitalism achieves the opposite of what libertarian law promotes. In any nation that implements capitalism, citizens are given the right to amass exchangeable commodities such as money or even property (Klein, 2007). This then inspires wealthy proprietors to diversify into the several industries, search for cheaper raw materials, and even cut wages in an effort to realize more profits. This naturally infringes on the rights of workers. In legal terms, capitalism prioritizes objective laws over citizen’s rights. Crony capitalism is today common in many nations due to the dedication that corporations show to their shareholders even when their activities negatively affect surrounding community or even company workers (Kang, 2002). It is inaccurate to assert that capitalism, like libertarianism, is based on the promotion of individual rights because modern capitalism has proved that it is shareholders such as corporate executives, and not ordinary citizens, who benefit most from free market trade. Karl Marx asserted that capitalist profits essentially amount to surplus value created through the theft of human labor (Kang, 2002). While this may not necessarily be accurate in all instances, it is evident that capitalists tend to be faced with difficult choices whether to preserve their respect for individual rights or achieve corporate objectives at the cost of others (Takala, 2007). In contrast to capitalists, libertarians do not prioritize the needs and wants of wealthy people, or defend the government systems that may have been created to provide for their whims. Libertarianism supports a market where each citizen, whether rich or poor, is given an equal opportunity to participate in the market by selling services or products. Libertarians also desist from supporting government intervention in the market, because this often results in big corporations being given numerous benefits due to their contributions to government. The main difference between capitalism and libertarianism has to do with the implementation of the rights of citizens. While both of these theories claim to support the rights of all individuals to own property and participate in market operations on an equal basis, capitalism does not support this fact in practice. The conditions created by capitalism tend to support the development of corporate organizations which oppress the members of the general population in order to realize more profits. Joan Nyokabi. "The Difference Between Capitalism And Libertarianism." DifferenceBetween.net. February 23, 2016 < http://www.differencebetween.net/miscellaneous/politics/the-difference-between-capitalism-and-libertarianism/ >. This conclusion is seriously flawed. The conditions created by capitalism do support the development of corporate organizations (you fail to disclose that most of these are small businesses whose owners report their business income on their individual income tax returns) however, rather than “oppress the members of the general population in order to realize more profits” these corporate organizations (including their shareholders) are actually driven by the consumer (all of whom are members of the general population) and their profits and indeed their very existence depends upon the degree to which they provide the consumer (the general population) with competitive products and services that meet and exceed in all respects consumers’ needs and expectations and generally advance the human condition. Capitalism ensures that any business or corporate organization that falls short in the eyes of the consumer will sooner or later fail, and deservedly so.